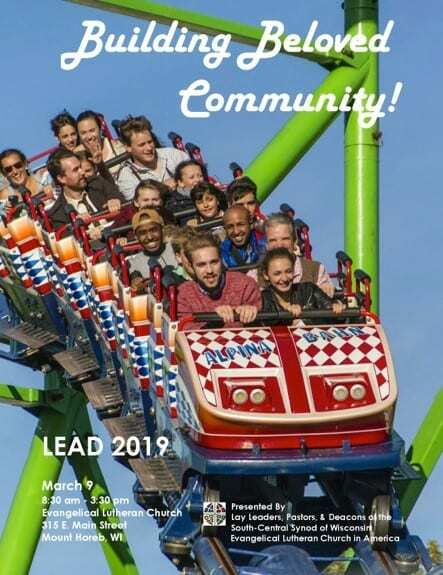 Leadership Education and Development Day “LEAD” will be held on Saturday, March 9, 2019 at Evangelical Lutheran Church, 315 E. Main Street, Mount Horeb. The event begins at 8:30 am and ends at 3:30 pm. We are excited to welcome as our keynote speaker, The Rev. Dr. Stephen Paul Bouman, Executive Director of the Domestic Mission Unit of the ELCA. His keynote: “Three Roads to Beloved Community” will engage us in communal conversation about what we seek in our own lives of discipleship, in the life of our communities of Jesus, and our impact in the world. Workshops will be plentiful, a delicious lunch and free childcare will be provided and you will have plenty of time for networking with your counterparts in other congregations and with displayers from synod and Lutheran-affiliated ministries. Don’t miss this event! It will be better with you there! Online registration will go LIVE on Tuesday, January 22. Watch for updates in the synod’s e-newsletter, What Matters! If you have questions about the event, contact Deacon Vicki Hanrahan, Assistant to the Bishop for Congregational Life at 608-270-0201. Pastoral Letter on Retired Pastors The Youth & Family Ministry Network of the SCSW Will Gather!